Our trip started out with a terrifying bus ride, winding up, down and through the Sierra Gorda, an ecological region in the Sierra Madre mountain range. There we were on a two-lane road carved onto the edge of the mountain, terrified for our lives. You’re probably asking why the hell we’d ride a bus through Mexico, but the first class buses are nicer than planes here, complete with fully reclining seats, wifi, TV and a snack. I recommend the Primera Plus bus company who we’ve used for all of our travels here – I don’t recommend taking the bus on this particular trip if you are afraid of heights. Take a car with a lower center of gravity! The view of the mountain range was unlike anything I’d ever seen, but don’t look down or you’ll realize how truly high up you are and how close you are to certain death should a tire slip. EEEE! My stomach flips just thinking about it. Our first stop was the small town of Jalpan, one of five nestled into the valleys of the mountains that are home to Franciscan Missions in the region. The mission is the main attraction in the town square, but there is so much more to Jalpan than this. To give you a little flavor, there is nearly no English spoken here so a firm grasp of Spanish or a very good translation app is necessary. It is not a culinary center, so we cooked our own rice and beans or ate at the only touristy restaurant in town – Las Carretas. I’m not adventurous enough to try street food! We stayed in an eco-lodge in the middle of nowhere – a 20 minute cab ride from the town center. Casita Ecologica is a friendly, self-sustaining place to stay with buildings made of mud and other natural materials. You’ll want to make sure you bring your own food with you if you stay here, as there is none available for guests on-premise. Also note there is running water, but no flushing toilet. We had to pour ash and sawdust on our pee! Let me get into this for a minute in case you are reading this for a recommendation on where to stay. There is a toilet seat to sit upon, but you’re essentially doing your business into a bucket which is changed out every morning and evening through a trapdoor on the side of the mud structure. Glamping it was not, but I found it really important to go with the flow on this trip since we really didn’t know what we were getting into until we arrived. Here’s a pic of our mud-home. Margarita, the owner of Casita, hooked us up with a driver for our second day in Jalpan, so that we could see some of the beauty the area had to offer. For $1500 pesos (~90USD), we travelled to three sites: Tancama, Cascada Chuveje, and Puente de Dios. Tancama, an archeological zone 20 minutes down a dirt road even further in the middle of nowhere than we’d already been, was a serene site with expansive ruins dating back to the year 200. We were the only people there, so were able to wander freely and enjoy how peaceful and spiritual it was. I spent some time imagining the bustle that must’ve surrounded this area at various points of time throughout the region’s history. But now, it lies empty and far from everything else. Our next stop was Cascada Chuveje, a beautiful waterfall at the end of a narrow path that wound through the jungle. When we arrived it was so green and serene, I screamed to Evan, “We found Ferngully! It exists!” We were the only people there to enjoy this site, as well, which is part of what made Jalpan so wonderful compared to other places in Mexico we’ve visited. There simply weren’t that many tourists in this part of the country, so doing touristy things was not unpleasant. The off the beaten path activities were the only activities to do. Our final stop was Puente de Dios and was the highlight of the day. These caves and waterfalls were truly miraculous and tucked away deep into a forest. For $300 pesos (~18 USD), a guide took us through a series of trails and ladders up and across a river until we reached Puente de Dios. I’ve never seen anything like this where the rushing water had carved chutes into rocks. You stop to wonder how someone even found it in the first place and how something like this simply exists and will continue to exist long after I’m gone. The next morning, we hired a cab to drive us 90 minutes through the mountain to Xilitla, our ultimate destination. He drove like a bat out of hell through numerous hairpin turns – I had to force myself into an out of body experience just to make it through the trip. But arriving in Xilitla was out of this world, and you really see the landscape change from arid to verdant. Suddenly we were in a subtropical rain forest in a town tucked into the side of a mountain! Xilitla mountain landscape changes to green! There are not a lot of options for places to stay in Xilitla, either. 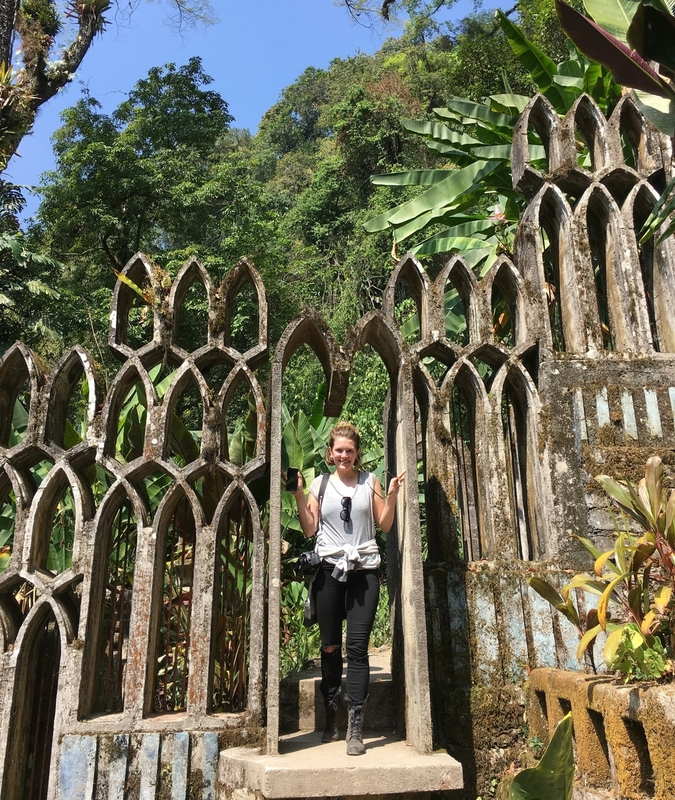 There is one hotel in town, two near Las Pozas, and then a few hostal-esque places near the garden. AirBnB also has many more options, so I’d go that route if we went again. We’d heard about Casa Caracol from a tour guide, so I booked it without knowing much about it. This place is a straight-up hippie commune – complete with tipis that sleep 6, shirtless dudes wandering around with blunts hanging out of their mouths, and Bob Marley playing on repeat at the on-site bar. It was an amazing slice of life where we stuck out like yuppie-scum sore thumbs. We didn’t stay in a tipi because we aren’t into sleeping with strangers. Instead we rented our own cabana for the night and woke up fresh for Las Pozas, which was right across the street. This was it! The moment we’d been waiting for and the culmination of our trip. This sculpture garden is the main attraction of Xilitla, so it was quite crowded with tourists from both Mexico and around the world. It took 40 years for Las Pozas to be completed after it was dreamed up by Edward James, a patron of some of the great surrealist artists like Salvador Dali and Rene Magritte. Imagine an M.C. Escher graphic come to life that you can climb upon. That is Las Pozas. Only pictures can describe. The coolest part about travelling through Mexico is that you can be very flexible with your plans. If you feel like packing up a day early and heading home, you simply change your bus ticket and move on to the next place. Which is what we did after our 24 hours in Xilitla. 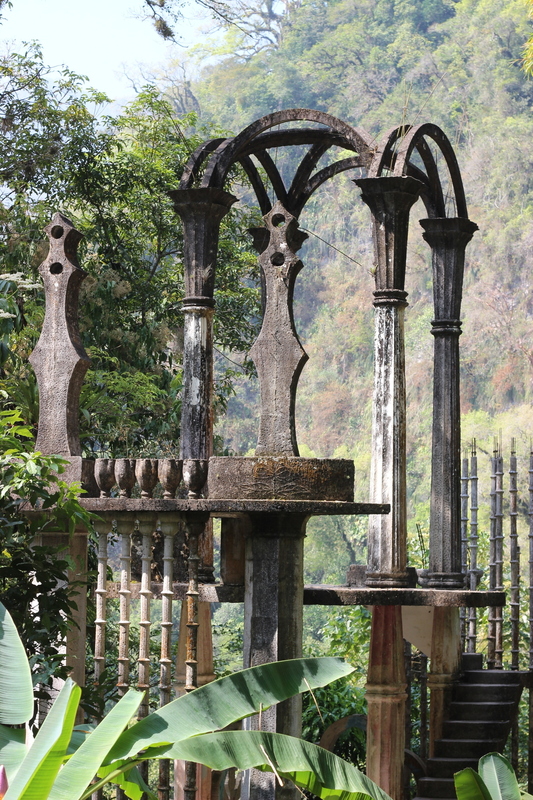 Once we wrapped up at Las Pozas, we decided to head back to a city and spend a night in a fancy hotel. We’d roughed it for 4 days (and smelled like it), so we wanted hot showers and a fantastic meal. And we found that right in Queretaro – a large city one hour from our home here in San Miguel de Allende. For the price of a tiny room in a 5-star American hotel, we were able to stay in the Presidential Suite of the Casona de la Republica hotel in Queretaro. And if you’re looking for a great place to eat, head to Cafe Breton! Outside Cafe Breton in Queretaro – showered! Though I sound like the whole trip was hearts and stars and unicorns, I’ll come clean about the fact that there was a lot of it that was actually quite uncomfortable for me. I generally like to think of myself as adventurous, and I am, but there were a lot of things that took me by surprise on this journey. The fear I felt on the bus ride was intense and beyond my control. The level of roughing it in our accommodations was uncomfortable because my standards and expectations are simply different. The amount of spanish speaking required was not a hurdle – I am proficient enough to get us around with ease – but it meant that we were relying solely on me to communicate with everyone we came into contact with. And the flexibility I had to practice when things were not as I’d expected took effort. But I did it. We did it, and it was magical.